Martin Hauer-Jensen, M.D., Ph. D., center, looks at some lab data on a transparency along with Daohong Zhou, M.D., left, and Marjan Boerma, Ph. D., right. Aug. 12, 2015 | August 12, 2015 | Led by Martin Hauer-Jensen, M.D., Ph.D., a team of University of Arkansas for Medical Sciences (UAMS) researchers has secured a $10.5 million grant to establish a center to study side effects of radiation therapy and other types of cancer therapy. The Center for Studies of Host Response to Cancer Therapy will be the first research center of its type in the United States. The grant, part of the Centers for Biomedical Research Excellence (COBRE) program of the National Institute of General Medical Sciences, will be given out over five years with a possible renewal for two additional five-year periods. The center’s primary objectives are to create a self-sustaining, multidisciplinary research center at UAMS that examines the mechanisms of and prevention strategies for cancer-therapy-induced toxicity and side effects. Another important goal is to help junior scientific investigators who have a common research focus in this area to establish themselves as independent scientists. Initially the focus of the new center will be on post-radiation therapy side effects; plans call for expanding it in the future to address the side effects of chemotherapy and other types of cancer therapy. Increasingly effective cancer treatments have produced dramatic increases in the number of cancer survivors, more than 13 million in the United States. As the number of survivors has increased so has the number of survivors experiencing the lasting side effects of cancer treatments. “While the importance of achieving cancer cures is duly recognized, comparatively little effort has been directed toward understanding the mechanisms of the side effects of cancer therapy and developing effective interventions to prevent them,” Hauer-Jensen said. UAMS has committed $2.5 million over five years in additional support of the center. The center also will integrate its research efforts into the other established and developing research programs on campus, including the programs of the Winthrop P. Rockefeller Cancer Institute, the Translational Research Institute, the COBRE center for Microbial Pathogenesis and Host Inflammatory Responses and the COBRE Center for Translational Neuroscience. “The center’s collaboration with the Cancer Institute at UAMS is particularly important given that the institute is the state’s only comprehensive cancer treatment and research facility and serves patients from every Arkansas county, all 50 states and about 40 foreign countries,” said UAMS Chancellor Dan Rahn, M.D. Hauer-Jensen will serve as director of the center. UAMS researchers Daohong Zhou, M.D., a prominent stem cell and molecular biologist, and Marjan Boerma, Ph.D., a radiation biologist with extensive experience in irradiation techniques, will be part of the center’s leadership team and direct core facilities. 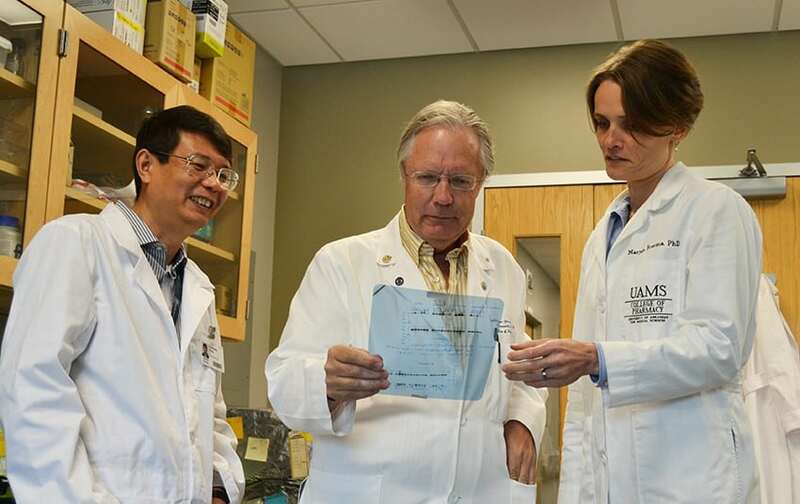 Hauer-Jensen, Zhou and Boerma all are faculty in the Division of Radiation Health in the UAMS College of Pharmacy Department of Pharmaceutical Sciences. Hauer-Jensen also serves as director of the division.